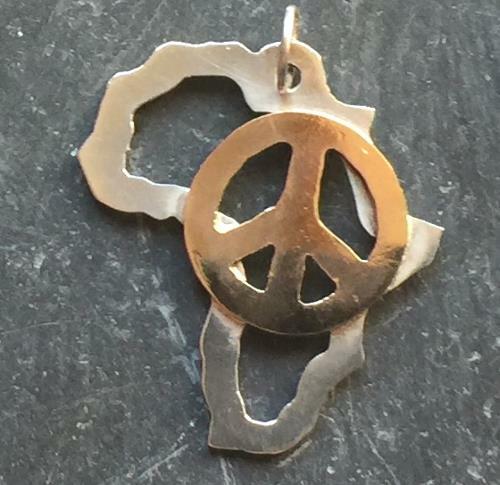 A lovely perfect shiny Argentium 935 sterling silver Africa outline supports a small shiny bright gold peace symbol. Total size is approx 2.5″ x 1.5″ (6 x 2.cm). Looks good on silver chain or leather cord. Open jump ring so may be fitted on any chain, cord or bracelet. One of a kind unique original. All items are handmade but will approximate photo here. Click on photo to zoom in. Press return on browser to return here. Each pendant is made from Argentium 935 sterling silver and 20/14KY gold fill in different layers to portray some feature with Africa. 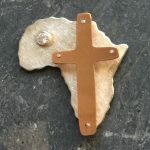 This one features a shiny silver Africa outline supporting a shiny gold peace sign. Open design means it will look different on different backgrounds.